Home › National List › Even Attorneys Need Protection Against the Flu! Even Attorneys Need Protection Against the Flu! Are you one of those people who doesn’t have time to get sick? Aren’t we all! Even if you’re one of the lucky ones who “hardly ever gets sick,” why take the risk of catching influenza when a preventative shot or nasal spray is so readily available? Apparently, in addition to thinking they don’t have the time &/or the need to get the vaccination, many people have enough questions and doubts about it that they purposefully avoid getting it. I’m not a doctor, and you should consult with yours if you have serious questions, but for me, getting a flu shot every year is a no-brainer. My insurance pays for it, and the only side effect I get is a sore arm for a couple of days. But what do the “experts” say? I found lots of helpful information on the Internet, at my local in-store pharmacy and from the Physician’s Assistant who gave me my flu shot this week! There’s more info than I can include here, so I’ll just cover some of the highlights that you might not know. Influenza is a highly contagious disease that can cause fever, cough, sore throat, headache, muscle aches, and fatigue (not to be confused with stomach or intestinal ailments that are also sometimes called “the flu.”) The rate of infection is highest among children. For most people, symptoms last only a few days, but young children, people 65 and older, pregnant women and people with certain other health conditions can get much sicker. The American Lung Association tells us that, on average, 1 out of 5 Americans (20%) suffer from the flu every year, 226,000 people are hospitalized, and depending on the severity of this year’s virus, deaths can range from 3,000 to a high of 49,000 people! Most deaths occur in those over 65. Combined with pneumonia, influenza is the nation’s eighth leading cause of death. It takes up to two weeks for the vaccination to become effective. Getting the flu shot exponentially reduces your chances of contracting the flu virus, but you can still catch the flu, especially if you have a weakened immune system. According to the CDC, those who get vaccinated and wind up with the flu generally experience milder cases with less serious complications. The only side effect I get is a mildly sore arm for a couple of days. The PA who gave me my shot admitted that her arm hurts for about 4 days. The CDC reminds us, “The viruses in the flu shot are killed, so you cannot get the flu from a flu shot.” Minor side effects that could occur are soreness, low-grade fever and aches. Over-the-counter pain relievers such as acetaminophen or ibuprofen can help ease pain and reduce fever. The nasal-spray flu vaccine is approved for use in healthy people 2 through 49 years of age who are not pregnant. When I asked my PA why people request it, she told me that it is most often given to children (and I suppose adults) who are afraid of a shot. In one large study among children aged 15 months to 7 years, the nasal-spray vaccine reduced the chance of influenza by 92%. Results were not quite so easy to determine in adults. Because the spray contains weakened live virus, there is a slightly increased risk of mild side effcts. Severe reactions to both types of vaccine are rare. Learn more here: http://www.cdc.gov/flu/about/qa/nasalspray.htm. Unless you fit into one of the categories above, make time to get a flu shot so you won’t have to take sick time, feel lousy, and risk exposing your family and others to this largely preventable illness! The flu vaccine is commonly available throughout the flu season, which runs from August to May. 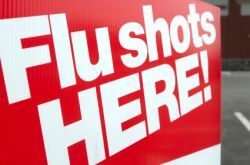 There’s a handy flu vaccine finder at http://www.google.org/flushot?address= Many locations list their prices, along with driving directions. Call the Centers for Disease Control and Prevention (CDC) at 800-232-4636 or visit the CDC web site, at www.cdc.gov/vaccines, for more vaccine information. Have you had your flu shot? Please comment “Yes” or “No.” We’ll publish the stats.